New York Cork Report: Dedicated to Local or Taking Advantage of Locavores? Dedicated to Local or Taking Advantage of Locavores? A few weeks ago, I did something at a restaurant that I almost never do -- at least not at a fine dining restaurant. I drank beer before and during my meal. On the surface, that's not that big a deal. I drink beer all the time. Heck, I was a beer geek long before I became obsessed with wine. Besides, sometimes beer is a better pairing that wine. Yes. It's true. So why was I drinking beer at Church & Main restaurant in Canajoharie, NY -- and why is it worth reporting? Their wine list infuriated me. It infuriated me enough that refused to drink anything from it. I can be stubborn like that. So, I drank beer. Some good beer by the way, but we'll get to that later. Let me take a couple steps back and provide some context before I continue. I was excited to eat at Church & Main -- a restaurant purportedly dedicated to sustainability and supporting local farms and agriculture. My in-laws have eaten there several times and always rave about it. I've also read quite a bit about it online and I even saw it listed in a Whole Foods-produced calendar. It sounded like the kind of restaurant Nena and I would love. When we had the chance to go, we jumped on it. On the surface at least -- and when it comes to the food -- the locavore-friendly reputation is well deserved. The menu is seasonal and locally driven, to the point that there is a separate sheet in the menu listing the local farms that have grown and raised the food on your plate. I dig that. I wish more restaurants did that. The food was terrific too. From the perfectly cooked veal sweetbreads with charred onions and veal jus to pan-seared diver scallops over (no doubt local) spaghetti squash with arugula and pistachios to slow-roasted local pork with white beans, leeks, celery root and beets, to monkfish with pumpkin-potato hash with hen of the wood mushrooms, it was all delicious. Best of all maybe was the semolina pudding cake with local apple compote and fresh whipped cream. Well-prepared, locally sourced and delicious. This should have been a meal to remember, and I it was -- just not for the right reasons. The wine list was short, maybe 6-8 wines, which is often a good sign. Usually that means thoughtful selections that are hand-picked and tuned to the chef's style of cooking. But as I read the list, beyond being infuriated -- we've covered that part already -- I was flat out disappointed to see how uninspired it was. Yes, there was one local wine, a riesling from Dr. Konstantin Frank, so there is that. And that's what Nena drank, not being as stubborn as I am. The rest of the list? Cheap, mass-produced plonk. And not suited to the fresh, local food either. I didn't grab a copy of the list or take any notes, but I remember a cheap, over-oaked chardonnay that I've had before , a cheap (like $10 retail) malbec from Argentina, a decent-but-boring California pinot noir and a ubiquitous Italian pinot grigio. In short, it was the kind of list that we've all seen a million times, at a million restaurants, probably chosen by whatever distributor rep happened to be in the right place at the right time. A boring, throw-away sort of list. I don't know how you handle these sorts of list, but I usually ignore them and don't give them much thought, largely because they are most common in middling restaurants that I often find myself in only because they are family friendly (I have a toddler after all) or because I've been invited to dinner by someone far less interested in food and wine than me. It's okay. I know how the system works. I can accept it at restaurants of that ilk. Really, I can. But at any restaurant that portrays itself as "sustainable" and "supporting local agriculture" it is absolutely unacceptable. Now I know that there are "local" restaurants that don't focus on local wines. Eric Asimov, chief critic for the New York Times, recently wrote a piece about restaurants in the San Francisco Bay area sourcing their food locally but looking mostly to Europe for their wines lists. The main (and best) argument those restaurants make is that many California wines aren't as food friendly as those from Italy, France and other European countries. I tend to agree with that generalization, but the same isn't true of New York wines. All of New York's wine regions are cool-climate, meaning that natural acidity and balance is preserved throughout the growing season. New York wines are among the food-friendliest made in the U.S.
Maybe Church & Main is just looking for cheap wines (the markups weren't bad, by the way) that they don't have to think much about. But, for a couple bucks more per bottle (if that), there are similar-style local wines that would not only support local wineries, but pair better with the food. Instead of that plonky California chardonnay, serve the barrel-tinged but balanced chardonnay from Lamoreaux Landing on Seneca Lake. Lose that boring pinot noir and serve the non-reserve bottling from Heart & Hands Wine Company on Cayuga Lake. Put away that insipid pinot grigio and pour Ravines Wine Cellar's dry, clean Keuka Village White. It's not hard to find affordable local wines for your wine list. Really it's not. Plus, if you really care about sustainability, getting wines from a couple hours away is a lot better than stuff trucked in from California. Before I forget, let's talk about that beer list too. Even with local breweries like Brewery Ommegang and Saranac less than an hour away from the restaurant's front door, the beer list didn't offer a single local brew. Not one. But, at least the Samuel Smith Ale and Wolaver Brown I drank were organic, which can't be said about the non-local wines on the list. So the question I'm left asking is: Do you think restaurants like this are truly dedicated to "local" or are they just using it as a marketing hook -- a way to get locavores into their restaurant because eating local is so hot and trendy right now? In my opinion, either you're dedicated to it or you're not. And if you are, it goes well beyond the produce and meat you buy. What are some of the other "local" restaurants that you'd like to see carry more or better local wines? I should mention that it's possible something is changing and/or happening with Church & Main. Their website has been down for weeks now, and when my in-laws were there over the weekend, there was only a single wine available. Emails that I've sent to the chef-owner have gone unreturned to this point. I couldn't agree with you more. And to add in my own rant - if a restaurant takes the time to select thoughtful wines to go with fantastic food, please don't serve it too warm or too cold. Room temperature is not 70 degrees. Not all restaurants are located within a couple of hours of food friendly wines and for the most are truly challenged on what to do. I feel we need to think of local as "planet earth" and all take the neccessary steps in our daily lives to make planet earth a better place. This will create the peace of mind to enjoy the bounty from around the world. Love your comment on cool climate - food friendly wines. Truly agree with you on this point. The restaurant you mentioned just needs a tune up on the wine list. They are almost there. Amen, Lenn! Just read this weekend that 33 new wineries opened in the Finger Lakes this year! With the wonderful selections offered there, and in the other regions of NY, I'm sure this restaurant could find some quality wines within their price range. What a shame, they obviously put a lot of effort into that menu. Extending the locavore concept to their beverages could only enhance it. This type of selective locavorism reminds me of the bait and switch that occurred with organic farming a few years back. Those who were practicing organic methods for decades suddenly had to pay the govt. to be able to use the title "organic" with their farms. Others, not as organic, were able to call themselves that if they paid the govt. fee. Those using either title with their businesses should embrace the concepts wholly; their customers deserve such honesty and will repay them with continued patronage. When I was in Binghamton in September I ate dinner at Outback Steak House and they had a separate wine list of about 12 New York State wines--by the bottle and by the glass. I was very impressed. But, strangely, when I went to a high end restaurant in Binghamton the next month the wine list was many pages long and only included maybe 3 New York wines and only a riesling by the glass. Susan: Really? Outback Steakhouse had local wines? That's incredible and great to hear. I wonder if the ones near my house have local wines. Probably not, but maybe I'll have to stop in and check sometime. Terrific and passionate writing! I am encouraged that a chain restaurant is carrying local wines - most are difficult to get into because the wine list is determined by "corporate". I have tried selling to chains and it is so difficult. In general, chains want international brands. I can tell you from a winery's perspective, it is difficult to call on restaurants because their availability is limited (ie, 2-3PM) and everyone they see comes then. It isn't really practical to visit more than 1 a day to have them taste the wines. We have had very good success with groups like the Field and Fork network, where we can introduce restaurants to our wines in a group setting. From a restaurant's perspective, local wines are harder to bring in because not every winery visits them. Most wineries self distribute which means the restaurant will have to deal with individual suppliers when they need stock, etc. Today it sounds like this restaurant has it's wine list composed by the distributor, making it easy for the restaurant (this is a common practice). A dozen NY wines from 6 wineries adds some supply chain complexity, though I would think for a restaurant specializing in local they have the same issues with food. Any winery serious about self distributing will also call regularly to check stock, arrange tastings for customers, etc. I'm glad I'm not the only one who has experienced this and was pissed off by it. As Duncan suggests, committing to a local wine list or, at the very least, serving a few local wines, is an extra effort for a restaurant and in most cases represents extra effort on the part of a winery. If your hook as a restaurant is "locavore", "sustainable" or any of these other buzzwords related to locally sourced, seasonal dining, you're telling customers that you want to make this extra effort. It's that simple. In this state, with tremendous variety of food-friendly wines within 250 miles of just about everyone, touting local and then ignoring the wine list is laziness. Ditto with beer. Our restaurants simply have no excuse, with the number of world-class breweries and wineries in this state, to leave NY unrepresented on a menu. Having worked in a restaurant for years, I can offer one salient piece of advice to readers outraged by this issue: a comment or request to the manager or owner of a restaurant is worth ten complaints on the internet or to friends. Ask restaurant employees why the establishment doesn't have local wine and beer. If they start carrying local stuff, drink it! In the craft beer world we encourage beer geeks to make their first pint of the evening a "local pint", in support of local breweries and the bars/restaurants that work with them. Your wallet is, as always, your most powerful weapon. I'm fairly positive that 33 new wineries DID NOT open up in the Finger Lakes this year. In the past five years it's a possible number but still a little high (I'd put it at around 20 since 2000). Statewide, those kind of numbers start to make sense for relatively recent timeframes. Great article and insight as usual. I think every wine and beer lover gets disappointed when they head out to a great dinner at a well respected restaurant only to find the drinks list a mere after thought. I honestly am not so sure that "locally sourced" is the issue at hand, and rather a restaurants focus on their wine list should be the concern. From a customers perspective restaurants seem to take a number of different approaches to their wine list, as you mention perhaps regurgitating what their rep is pushing this week. Or the overabundance approach, if we stock a little of everything our customers must be able to find something they will enjoy. I would think most of us however appreciate those restaurants that put as much focus on their wine list as their intricate menus. To me, chefs and sommeliers need to put as much effort into their wine list, local or not, as into their menus in order to be successful. One interesting restaurant wine list is Tastings in Rochester. This restaurant is owned by Wegmans, sits inside a Wegmans store and offers 119 wines on it's list. Four of the 119 wines on the list are NY wines (3%), and German Rieslings outnumber NY. Wegmans advertises heavily that it carries local products and is working to be as green as possible, especially on their web site for the stores and this restaurant. Is wine not considered local food? To me, it's part of the meal. Great point on Wegmans. I'll forward this piece and the comments to the folks over there; hopefully they'll address it. Rant on, my man. Restaurants needs to hear from customers directly on these issues. 160 wineries in the entire state since 2000 sounds like a believable number, and the 33 this year sounds surprising but believable. That wine list you mentioned looked awful. I've seen better wine lists at diners. Really. I would expect a restaurant that puts so much emphasis on local food quality to at least place some importance on the beverage accompaniments - - - going local on wine is a bonus, but going good should be foremost (and shouldn’t really be that hard). You should send something to the restaurant complaining about the list. Maybe a single email won't force change, but if everyone sits silent then for sure there will not be any change. I've done this on several occasions and even a few times in your own back yard (Frisky Oyster and Vine in Greenport have AWFUL local selections). I haven't eaten at those establishments in over a year, but last time I was at Vine they had 50+ wines but only about 5 or 6 that were local. Are you kidding me? What a blatant disregard for their surroundings. I've even sent a letter to a well respected restaurant in CT that I never ate at telling them I would not eat there because the prices of their wines were too high (they were charging 3 - 4 time RETAIL). I’ve never received responses from any of these places, but at least they are aware that 1 consumer (and hopefully more that follow my lead) are unsatisfied with their wine program. My perception of a restaurant rests equally on the wine list (quality, price, and suitability to the menu they serve) as it does to the food. Restaurants that don't get that don't get my business. Dave, I didn't without making some kind of stink about it...I left a lengthy written comment about it in the comment book located on a table in the center of the restaurant, signed with my name and the URL for this website. It really frustrates me both as a sommelier and a New Yorker. Although, born and raised in Southern California, I always considered myself a New Yorker from my very first trip in the early 80s. I moved to New York and lived there from 98-01 & looking to relocate back there fall of 2010. Since I became I sommelier in 2002 Ive been facinated with New York State wines and for the past few years, I've been a champion of them. I can't fathom why a New York restaurant would serve inferior wines? Merlot flourishes in New York, so does Cabernet Franc. White wine like Seyval can be so beautiful when it comes from New York. And The Finger Lakes? Wineries there make Rosés, honey & fruit wines that are just fabulous! I can only hope, for their sake, Church & State make good use of their location, support great local state wine before I move back to NYC. Oops, thanks for catching my goof, Jason. 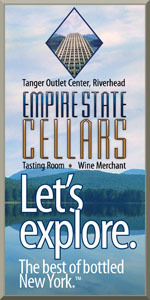 Should be 33 new wineries this year across New York. Impressive numbers for the decade, especially with NY's economy being in the dumpster even before 9/11. I admire the courage of all those winemakers. Wish more restaurants supported them. Disappointed to hear that just four wines from NY are on the Tasting's wine list. Rochester is so close to many wonderful wineries. Ridiculous! Wegmans is good about promoting local produce, why not NY wines? Lenn, etc., is absolutely positively CORRECT that so many of the restaurants and even the retailers ignore the NY wineries. It's as if we don't exist. And that is totally lame and on their part lazy. The majority of NY wineries do not (or will not) have a distributor partner to help them get their product to the accounts across the state. Relegated as they are to self-distribution, a restaurateur or retailer can be easily discouraged if they don't get the level of service they expect from the vendor. If winery XYZ only delivers to Watertown once or twice a month, and the restaurant can get Rosemount any day of the week, who do you think is going to get the slot? If Winery XYZ has their Chardonnay by the glass and it runs out on Thursday and they need a delivery for Friday but that winery is six hours drive away, guess who loses the placement? Good wine programs are A LOT of work, even for full time sommeliers. Using micro-lots of wine or wines that are difficult to maintain make that program harder. That doesn't mean it isn't a worthwhile pursuit though, I'm just saying there A LOT more to this than you may know. That said, there's no excuse whatsoever for an account that claims to be locally oriented to ignore local wine. No excuse. Go find the local wines that are available regularly, we're out here too! Thanks for chiming in, Jim. Your diverse experience is helpful to this discussion. There is no doubt that creating and managing a great wine program is hard work, but you do agree that there is quite a disconnect here, right? And, more and more local wineries ARE using distributors now. The wines are available. Restaurants just need to put some effort in -- especially restaurants that are putting so much effort into sourcing local ingredients. Jim, you summarize well what I've heard and assumed about the perspective of restaurants. At this point, most NY wineries simply do not speak the same language as many restaurants. However, I do think some (not all) restaurants should know better. If you proudly source local ingredients, you can source local wine without too much extra trouble. If you're within a 90 minute drive of a major NY wine region, then you can re-supply without too much extra effort. If you, as a restaurant owner, have proud local and regional roots, then you should make a little extra effort to support the region's wines. This won't cover a lot of restaurants, but even a 10-15% boost would help NY wines out enormously! Great comments for sure. I own a winery on the Niagara Escarpment and we self distribute to about 80 stores and restaurants. We only wholesale what we have quantity of for the year. Short runs or experiments for the tasting room are limited to our own retail. If we are running low on a particular variety, we pull it from the tasting room to ensure the restaurants and stores will have supply. We have worked too hard at establishing these relationships to loose our place on a wine list. It is a very competitive market. Having said all that, restaurants specializing in local food seem to deal OK with a 4 week strawberry season, and local vegetables in season. If the food menu is open to variation, why not the wine menu? I agree with Jason that even a 10% boost state wide would be huge for the wine industry. 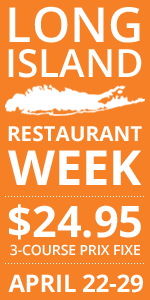 I think it is happening through some promotions like "local restaurant week"
Good comments. Duncan shows us the thought process involved with "servicing" the accounts properly and proactively. Managing the expectations of your wholeslae customers leads to better wine lists and better customer experiences. Restaurateurs like that. Jason shows us what the reality on the ground is - that there is little room for lame excuses - if you can change the food menu, you can change the wine menu. Be proactive with the beverage program! And Lenn points out that there is a disconnect indeed - between food and beverage programs, and since Chefs rarely control the wine cellar (which is a front-of-the-house operation) there is truly a disconnect. Naturally that does not include the best and brightest restaurants - those that deserve our support. Let's support those restaurants and retailers that care for us by nameing them, dining with them, and patronizing them. Let's also not pretend that every wine made in NY is a great wine, and that we still need to impress our on- and off-premise customers with quality and value. We must compete with the world, on their level. It is always astounding to me that so many restaurants that focus on local foodstuffs ignore local wine. The problem seems to be twofold. First that local wine still carries the reputation of being 'sub-par' which is a huge issue in the middle of the country (although it seems ridiculous that should be an issue in New York State). The other is economic. Small wineries don't have the ability to discount their wines and they don't have distribution channels to get into restaurants. For restaurants who are only paying lip service to "local" this is a considerable roadblock. For those who are dedicated? There is no excuse. as the owner of Church & Main, the main waitress, the wife of the chef, and the one responsible for ordering and selling the wine, I find it hard to believe that such an intelligent writer and wine drinker cannot see the difference between what he has experienced at Church & Main and elsewhere. not only are we a family owned and operated business, we eat what we preach. Our dedication to and passion for using local ingredients has not been fueled by a fad. We have been inspired by the farmers who come to us and present us with the fruits of their labor. our dedication and passion is evident, all those patrons who feel that they have become part of the "family" who thank us for helping them learn about the issues of sustainability and health are who we are here to serve. it is ashamed that there aren't more of these people. those who put food and family first. have you considered the economic impact that we and many other restaurants have been facing for over two years now? It is a shame that you have taken so long to come and make your judgement. You have been witness to the final breaths of a fine restaurant that upstate new york cannot support. Had you come in the past you would have been offered a richer variety of foods and wines. Maybe higher quality toilet paper or more decorative candles would have improved your experience, but when the well starts to run dry we find it best to maintain our standards of food production. I do believe your wine selection was certainly enjoyable if you had opened your mind and thought about your experience as a whole. And by the way, if you have so much time to write a blog and galavant around the state, maybe you could involve yourself in the issues that we small restaurant owners face with limited purveyors, uneducated wine salespeople, minimum orders, and out of stock items. Maybe if we had cut out the expense of our liscensing and wine/ liquor inventory we may still be in business today. Our people are willing to deal with limitations in order to enjoy the best food around. Tell your parents, "thanks for their support". Oh and by the way... eat well. Thanks for your comment and I'm sorry to hear that the restaurant is in the "final breaths" stage. It has obviously been a difficult time for restaurants the last several years, and any casualties are sad to see. Candles and toilet paper mean little to nothing to me when I'm dining out. It's what goes into my mouth that matters most -- the food and drink -- followed closely by service. Ambiance really means very little to me in my personal dining experiences. You should be applauded for maintaining the high quality of food during these tough times. As this post indicates, the food was delicious. That said, my "experience as a whole" does include the wine, which was subpar and not thoughtfully chosen. Any diner's experience is a snapshot of a restaurant's lifetime, and my snapshot was less than it could have been. That cannot be argued. My snapshot came later that I'd have liked, but your restaurants is a good 4-5 hours from my home. Good luck in your next and future endeavors.